Weston earned outstanding CCASS rating for the timely completion of a $2.1M project to repair and upgrade the fuel farm at Marine Corps Air Station (MCAS) Quantico, VA, responsible for the helicopter transport of the President of the United States. Weston was contracted to replace and upgrade aging DoD fuel infrastructure and system components at the MCAS Quantico Fuel Farm, which supports flight operations for Marine Helicopter Squadron One (HMX-1), which, among its critical duties, is responsible for the helicopter transport of the President of the United States and is the primary operational test and evaluation unit for Marine assault support helicopters. 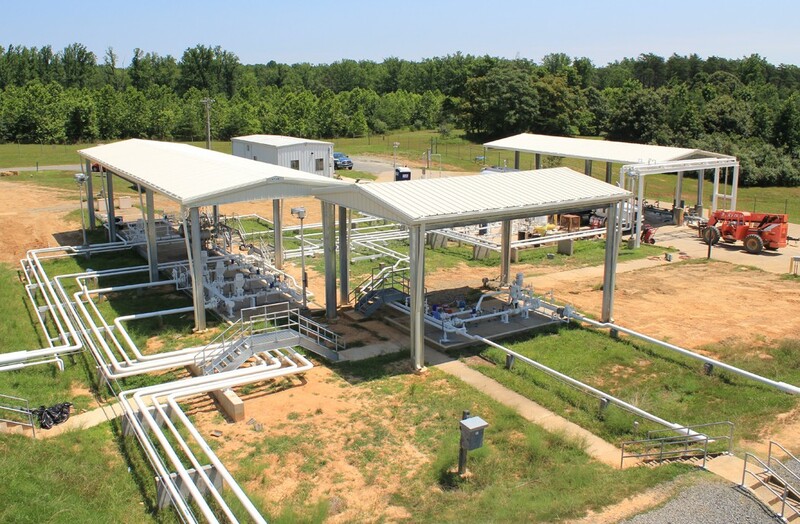 With this unique mission, MCAS Quantico Fuel Farm places a particularly high value on fuel quality, reliability of its bulk fueling systems, and security when performing work at the installation. Weston designed and installed 10 new expansion loops to control hydraulic and thermal expansion, which could affect tank shell deflection. We also added a new thermal relief valve (TRV) system for the entire facility, which included 70 TRVs that cascaded back to the tanks. Other piping upgrades included replacing four pressure vessel safety relief valves and seven isolation valves; installing a vapor recovery system to the motor gasoline (MOGAS) offloading area; replacing portions of the JP-8 filtration and issue piping; and removing and reapplying pipe coatings for all fueling facility equipment and carbon steel piping as needed. For these activities, lines were drained and locked out and tagged out prior to cutting or welding. Certified welders used the gas tungsten arc welding process and carbon steel ER 70S-2 filler metals to ensure a complete weld. A total of 10% of the new welds were tested using radiography methods, and 100% of the new piping and valves were pneumatically and hydraulically pressure tested, painted in accordance with UFGS, and labeled according to Military Standard (MIL-STD) 161G. Safety planning and stringent work execution ensured that no releases (e.g., lead, fuel, paint) occurred and no workers were exposed to hazardous or toxic conditions. Weston verified and redesigned the piping expansion loops and the pipe anchor systems to allow safe movement of the system without constraints. This design increased the piping loops and replaced the pipe anchors with standard slide guide assemblies. New pipe supports and pipe support foundations for the expansion loops were designed and installed. Weston performed hydraulic calculations to determine the compressive and expansive stresses of the pipeline and the effects on the tanks. Weston removed existing JP-8 equipment and piping and installed a new JP-8 filtration system and new stainless steel issue piping. Installation included two new stainless steel horizontal coalescing filter separators, which were rated at 300 gallons per minute and met API 1581 and UFGS Aviation Fuel Distribution and Dispensing requirements. All welds were complete penetration groove welds. The existing loading arms for JP-8, diesel, and MOGAS were also removed and replaced with MIL-STD swivel joints, couplers, nozzles, and hoses. After all new equipment had been installed under these first two major work packages, Weston filled, cleaned, and flushed the piping and new components. The filter vessels, existing control valves, and existing offload scully system were tuned, tested, and commissioned to ensure that the new work operated seamlessly with the remainder of the fuel farm equipment, although not part of Weston’s Statement of Work. During the commissioning of the new equipment, the set points for control valves and overfill protection and other operational functions of equipment that were not within this TO scope were also tested and corrected to provide a fully useable system. To ensure that the end users had a functioning system, each loading and offloading component was tested and calibrated. As each fuel type was run through the commissioning, vessels and valves were adjusted. At the completion of the commissioning process, the existing system components were recommissioned with the new equipment.